Just as I was about to send out this edition of Edge announcing the publication of Intelligent Thought: Science Versus The Intelligent Design Movement, I received the email below which it a stark reminder of why this book is necessary, why it belongs on your bookshelf, and why sixteen of the world's leading scientists (and Edge contributors) dropped everything to write essays on a crash schedule so the book would be published before the end of the school year. Also, below, please find the (a) the chapter by Neil Shubin ("The 'Great' Transition"), evolutionary biologist at University of Chicago who was responsible for the discovery of "Tiktalik", the 3.5 million year-old fossil that gives evidence for the water-to-land transition, and (b) the letter signed by all the contributors sent with the book to every member of Congress. Maulik Parikh is a post-doc in the Physics Department of Columbia University. He is leaving the U.S. to teach physics at a university in India. I have been teaching a new course on the frontiers of science, required for all freshmen at Columbia. These students are mostly sharp, capable, and open-minded. Still, many of them think that intelligent design should be studied in the interest of being fair and balanced. What's troubling is that even those who accept evolution often treat it as a matter of belief, of political persuasion, as if it were akin to being for or against free trade. And if they reject intelligence design it's often not because they can see its vacuousness as a scientific theory, but merely because the religious and conservative stripes of ID can sometimes look a little uncool. As for science, reason, evidence -- what's that? Science is the big news. Science is the important story. Science is public culture....Yet at the same time, religious fundamentalism is on the rise around the world, and our own virulent domestic version of it, under the rubric of "intelligent design," by elbowing its way into the classroom abrogates the divide between church and state that has served this country so well for so long. Moreover, the intelligent-design (ID) movement imperils American global dominance in science and in so doing presents the gravest of threats to the American economy, which is driven by advances in science and in the technology derived therefrom. This book — sixteen essays by Edge contributors, all leading scientists from several disciplines — is a thoughtful response to the bizarre claims made by the ID movement's advocates, whose only interest in science appears to be to replace it with beliefs consistent with those of the Middle Ages. School districts across the country — most notably in Kansas and later in Pennsylvania, where the antievolutionist tide was turned but undoubtedly not stopped—have been besieged by demands to "teach the debate," to "present the controversy," when, in actuality, there is no debate, no controversy. What there is, quite simply, is a duplicitous public-relations campaign funded by Christian fundamentalist interests. It is to be hoped that the ID movement, because of the very publicity that it has sought and achieved, will be seen by the majority of Americans for the giant step backward that it is. Our children are literally the future of our nation, which will increasingly need competent scientists and engineers to guide us through the coming technological revolutions — revolutions that are already under way all around us. There are examples in history of the collapse of great civilizations. There is no particular reason that the United States should be exempt from historical forces. The Visigoths are at the gates. Will we let them in? In some ways, the media chatter provoked by the intelligent-design movement has made collective fools of large segments of the American public. Educated Americans are dumbstruck by the attempt of the state of Kansas to officially redefine science to include the supernatural. Europeans cannot believe that such an argument should be raging in the twenty-first century—and in the United States, of all places, the seat of our most advanced technology and a leader in so many areas of scientific research. Not only is ID markedly inferior to Darwinism at explaining and understanding nature but in many ways it does not even fulfill the requirements of a scientific theory. I suspect there is more at stake than biology textbooks in Kansas. As a longtime observer of the science-government-politics triangle, it looks to me as if there is another hidden agenda: to discredit the legitimate scientific community. A well-respected scientific community can be a major inconvenience if one is trying to ignore global warming, or build unworkable missile-defense systems, or construct multibillion-dollar lasers in the unlikely hope of initiating practicable nuclear fusion. Evolutionary biology certainly hasn’t explained everything that perplexes biologists, but intelligent design hasn’t yet tried to explain anything at all. So, here’s the irony. Belief in special creation will very likely encourage believers to lead biologically fitter lives. Thus one of the particular ways in which consciousness could have won out in evolution by natural selection could have been precisely by encouraging us to believe that we have not evolved by natural selection....Anyone for "natural creationism"? Paleontologist, and U.C. Berkeley Professor; Co-director, the Middle Awash project, the world's largest and most successful scientific research effort into human origins and evolution. A denial of evolution — however motivated — is a denial of evidence, a retreat from reason to ignorance. Natural selection is not some desperate last resort of a theory. It is an idea whose plausibility and power hits you between the eyes with a stunning force, once you understand it in all its elegant simplicity. Inspired by the striking evidence from the Galápagos Islands, and armed with his novel theory of natural selection, Darwin began to reexamine the basic assumptions of creationism and to compare the predictions one would make based on these two radically different theories. The more extensive his reexamination became, the more he realized that the theory of intelligent design, which gave creationism its scientific legitimacy, was overwhelmingly contradicted by the available evidence. Nothing indicates that people who believe that life arose by chance also believe that morality is haphazard. An evolutionary understanding of the human condition, far from being incompatible with a moral sense, can explain why we have one. It should not, after all, be surprising if people who believe that all truth comes from an ancient text disagree with Darwin, whose ideas are in no ancient text. Rather than bemoaning the fact that fundamentalists disagree with Darwin, let’s ask a much more interesting and disturbing question: Why do so many non-fundamentalist theologians and religious leaders have no trouble incorporating Darwin into their worldview? To state that a given organ is so improbable that it requires design is just ill founded. The argument uses standard probability, which does not apply to the evolution of the biosphere. Scientific knowledge is by definition resilient. In societies where government or religion has tried to replace it with ideologically inspired fictions, scientists and nonscientists alike have resisted. Scientific lies can fool some of the people some of the time (even to the extent of being published in reputable journals), but exactly because scientific ideas are designed to be tested, in the end scientific lies fool no one. The universe is scientific. We don’t have an intelligent designer (ID), we have a bungling consistent evolver (BCE). Or maybe an adaptive changer (AC). In fact, what we have in the most economical interpretation is, of course, evolution. What counts as a controversy must be delineated with care, as we want students to distinguish between scientific challenges and sociopolitical ones. Rather than removing meaning from life, an evolutionary perspective can and should fill us with a sense of wonder at the rich sequence of natural systems that gave us birth and continues to sustain us. To conclude and reiterate, we express no opinion on the ultimate veracity of ID as a supernatural explanation. However, we commend to the attention of those who are inclined to superficially consider ID to be a true "scientific" alternative to evolution without a true understanding of the concept the foregoing detailed analysis. It is our view that a reasonable, objective observer would, after reviewing both the voluminous record in this case and our narrative, reach the inescapable conclusion that ID is an interesting theological argument but that it is not science. When we look back after 370 million years of evolution, the invasion of land by fish appears special. However, if we could transport ourselves by time machine to this early period, it isn't clear whether we would notice anything extraordinary. We would see a lot of fish, some of them big and some of them small, all of them struggling to survive and reproduce. Only now, 370 million years later, do we see that one of those fish sat at the base of a huge branch of the tree of life—a branch that includes everything from salamanders to humans. It would have taken an uncanny sixth sense for us to have predicted this outcome when our time machine deposited us in the middle of the Devonian. "Within each of us — our skeletons, our behavior, and deep within our DNA — lurks our distant past. Make the relevant comparisons and we find that our hands resemble fossil fish fins, our heads are organized like long-extinct jawless fish, and major parts of our genomes look and function like those of worms and bacteria. We unlock our history as we understand more about our DNA, as we compare ourselves to animals living and dead, and as we discover new fossils from around the world. With all of this history in our bodies, we are most definitely not designed 'intelligently.' Our chances of developing certain cancers, hernias, bad backs, injured knees, and even hiccups are the result of the history that we share with fish, worms, and clams." "We live in an age of discovery where the classic stories of evolution have become the focus of vigorous new approaches from genetics and developmental biology. Breakthroughs in genetics are beginning to tell us how bodies are built, in essence giving insights into the recipe that builds animals from a single celled egg. Couple these breakthroughs with the remarkable fossil discoveries of the past decade, and we have opportunity to present a new worldview of the human body." Shubin, a leading researcher in fish-to-tetrapod transition, startled the world on March 31 with the announcement in the journal Science of the discovery of Tiktaalik, ''a mosaic of primitive fish and derived amphibian", which led to global headlines. His moment of realization occurred while digging fish bones out of rocks on a snowy July afternoon. "While studying 380 million year old rocks in Ellesmere Island, at a latitude of 80 North, I was uncovering one of the key transitional stages in the shift from fish to land living animal. Everybody knows that fish swim with fins and animals that walk on land have legs. I was in the Arctic to learn how this shift happened. The fish I was uncovering had a wrist and fingers. A fish with wrists and fingers? I was immediately struck that this fossil reveals a very deep branch of my evolutionary tree. This is the origin of my wrists and fingers. Huddled in the tent during prolonged Arctic storms, it occurred to me that 3.5 billion years in the history of life are embedded in my own body." Shubin's essay, "The 'Great' Transition", was written after the discovery but prior to the March 31 announcement. 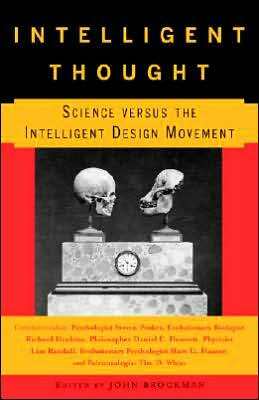 It is excerpted from Intelligent Thought: Science Versus the Intelligent Design Movement. NEIL H. SHUBIN, an evolutionary biologist, has been one of the major forces behind a new evolutionary synthesis of expeditionary paleontology, developmental genetics, and genomics. He is chair of the Department of Organismal Biology and Anatomy at the University of Chicago. The take-home message of this essay is a simple one: The transition of animals from water to land in the Devonian period, 370 million years ago, was profoundly important in one sense and entirely trivial in another. It had a major impact on our world, but it did not involve any unusual or extraordinary biological processes. The effects of the transition are all around us. We see them in the rocks. We see them in ponds and seas around the world. We even see them when we shake hands. Let me explain. To get a glimpse of the water-to-land transition, we need to see the creatures that lived on Earth at that time, then we need to look at our world today. When we do this, we see something sublime: The ancient world was transformed by ordinary mechanisms of evolution, with genes and biological processes that are still at work, both around us and inside our bodies. The gulf between water and land looks like an unbridgeable divide. The challenges of life on land are vastly different from those in water. It would seem that completely different animals must live in these distinct habitats. Animals that walk on land need to cope with gravity; unlike water, air does not support animals as they move about. Animals also can dry out on land; this is particularly dangerous, because water is needed for many basic metabolic processes. And, of course, breathing is different in water than on land. Animals that breathe air need a more efficient way than gills to take in air and extract oxygen. Because of all these factors, there are a daunting number of features that distinguish land- living animals from their fish ancestors: limbs with fingers and toes, necks, backbones with bony connections between vertebrae, a bony inner ear, a large scapula, ribs, paired nostrils, and so on. Biologists have singled out one of these characteristics for special treatment: True limbs are not seen in any living fish; for this reason, everything that is descended from fish is called a tetrapod (from the Greek for "four-footed"). For a long time it was thought that the shift from fish to tetrapod was driven by a transition from life in water to life on land. For example, it was thought that fins gradually evolved into limbs as animals began to walk. This thinking was captured by a famous hypothesis originally proposed by the American geologist Joseph Barrell in 1916 and later by the great American paleontologist Alfred Sherwood Romer. Romer and Barrell speculated that fish were forced out of water when Earth's climate supposedly became drier some 370 million years ago. As the ponds dried, so the story went, the fish had to learn to survive on land and so developed features that enabled them to hop from pond to pond. When Romer did his work, in the 1920s through the 1960s, there was only one early tetrapod known: a limbed creature recovered from 365-million-year-old-rocks in East Greenland. At present, East Greenland is a cold desert—dry, mountainous, and well within the Arctic Circle. Temperatures there rarely rise above freezing and for much of the year are colder than -20 F. But 365 million years ago East Greenland was a much warmer place, containing warm-water swamps, streams, and ponds. In the 1920s, a Swedish team led by Gunnar Save-Soderberg discovered the skeletons of the then-earliest-known tetrapods in these rocks. These animals had robust limbs, appeared to be partly land-living, and supported Barrell's and Romer's hypothesis—at least, initially. To see how our theories have changed since Romer's day, we need to follow new evidence, whose trail leads to notions completely unforeseen even twenty years ago. This change in thinking attests to the power of evidence and the way it can change our view of the world. In 1987 my colleague, Jenny Clack, began new studies in East Greenland and found the first important piece of evidence bearing on this water-land transition in over fifty years. She discovered the skeleton of another truly extraordinary tetrapod—one even more primitive than the one discovered by Save-Soderbergh. Sure enough, this creature has limbs with fingers and toes. It also has a very tetrapod-like hip, neck, and ear. What is remarkable is that this, the most primitive known tetrapod, is aquatic. It is not remotely specialized for life on land. It has fingers and toes but they are set within a limb that looks like a flipper. The limbs are delicate structures and seem unable to have supported the weight of the animal on land. It has a pair of hind limbs, but behind that is a tail that resembles that of a fish. Most important, this tetrapod has big gills. The inescapable conclusion is that the most primitive tetrapod was an aquatic creature. The implications are profound: The fish-to-tetrapod transition likely happened not in creatures that were adapting to land but in creatures living in water. Moreover, everything special about tetrapods—limbs, digits, ribs, neck, the lot--might well have evolved in water, not on land. This hypothesis made a prediction that could be tested: Aquatic animals more ancient than this new find should have intermediate structures. A search for these kinds of fossils dovetailed nicely with my own expeditionary research program in the late 1980s. Back then, my colleague Ted Daeschler and I were uncovering fish and tetrapods of the same age as Jenny's Greenland fossils in the roadcuts of central Pennsylvania. Pennsylvania is dotted with rocks of the same age as those of Greenland, but they need to be uncovered by dramatic means. The good news is that the state is not a frozen desert; the bad news is that fossils and rocks are mostly covered with trees, lawns, and cities. As a consequence, Ted and I made paleontological careers out of following the Pennsylvania Department of Transportation every time it cut a new road in central Pennsylvania. We found many fossils, but all of them were too young to test the issue at hand. We needed to go to a different area. Ted and I ultimately found inspiration in an atypical place. We began a whole new research program that sprang from a single figure in a twenty-year-old textbook. I was thumbing through my old college geology text and found a map that seemed unremarkable at first. It was a map of North America with colored patches showing where rocks between 360 million and 380 million years old are preserved. One big splotch was on the east coast of Greenland, home to Jenny's find; another patch covered the part of Pennsylvania where most of our field effort had been focused. There was still another such area, though, and this is what made the figure interesting. Large, and running east-west across the Canadian Arctic, this patch extended over 500 miles and had never been explored by vertebrate paleontologists, although it was well known to geologists, particularly the Canadian geologists and paleobotanists who had mapped it extraordinarily well. The rocks turned out to be older than those in Pennsylvania and Greenland. Ted and I first visited this area in 1999 and found little of interest. As it happened, we were fumbling around in the wrong part of the section; the rocks we were looking at were in the middle of an ancient ocean environment. When we shifted the expedition to areas that preserved ancient streams, lakes, and ponds, we found more fossils. During the 2004 field season, in these ancient environments, we found what we were looking for. Buried within a 370-million-year-old shallow stream was a collection of whole skeletons, one on top of the other. One of these creatures is an astonishing new kind of fish. The new fish has fins, scales, and gills. By all definitions, it is a fish. This designation seems to hold until we look at its skeleton. Inside the fin is the skeletal pattern of all tetrapod limbs, in primitive form. It has an arm bone, a forearm, even a wrist. The new fish has a neck much like that of the earliest amphibians. The skull of this fish is not cone-shaped, as fish skulls are, but flattened like a crocodile's, with a nostril on either side. This creature also has expanded ribs, something unknown in any fish. We had found, one of my colleagues mentioned in jest, a fishapod. The fishapod underscores one important point: It is no longer easy to distinguish a fish from a tetrapod. The arctic fossils were only the tip of a paleontological iceberg; after subsequent discoveries in Latvia, Scotland, and China, the distinction is now so fuzzy that many of my colleagues do not even try to define tetrapods by ticking off a list of features. Our earlier definition of tetrapods distinguished them from fish by their possession of limbs. In what group, then, do we put our fish with wrists? What other characteristics might help us? Perhaps we could use lungs to distinguish tetrapods from fish. Then we would have to explain why lungfish use gills and lungs both, yet have fully formed fish fins. Scales? Even here, we run into the same problem, because early limbed and lunged animals also have belly scales. Indeed, the difficulty that our taxonomists have in distinguishing tetrapods from fish is the inevitable result of finding fossil intermediates. This practical problem reflects a significant reality. One of the major transitions in the history of life is now bridged by a series of fossils dating from 380 million to 360 million years ago. The fact that we have discovered intermediates is not surprising; the surprise is that these creatures all appear to be aquatic and not specially adapted to life on land. This insight begs the question: Is there really a great divide between life in water and life on land? Answers to this question come from the study of fish alive today. Modern fish have adapted to live in very different environments, including on the sea floor, in the shallows of lakes or streams, even partly in air. To cope with these environments, they have a remarkable set of features that enable them to walk, breathe, and even climb. For example, the various species of walking fish have evolved "armlike" bones and joints allowing them to prop up and propel their bodies along the ground. Some fish, like the mudskipper, maneuver in mudflats and spend a considerable period of their lives outside water, able to breathe air because the back of their mouth can absorb oxygen and relay it to the bloodstream. Mudskippers can hop good distances on the mudflats; some of them even climb trees by reaching up the trunk with their front fins and holding on with their hind fins. What is important is that these various adaptations to land have evolved many times in fish. Several different kinds of fish climb trees; in addition, there are many different species of fish that breathe air, live part of their life on land, and walk about. The boundary between water and land is quite porous and bridged by modern fish from around the world. In fact, the adaptations we see in the fossils of the fish-tetrapod transition seem almost trivial in comparison to the living animals. Mudskippers and the other walking fish are all very interesting, but are they extraordinary in an evolutionary sense? No, they are not, and the reason is instructive. Hopping, climbing, and breathing fish are just animals that have evolved to live in different kinds of aquatic and subaereal habitats. They are able to breathe air, hop, or climb because of subtle changes to their bodies; no revolutionary changes are needed. In evolutionary terms, the only way they will be notable is if their lineage is prolific and their descendants do great things. The relatives of the fish and tetrapods from Canada and Greenland were prolific; they are part of a trunk of the evolutionary tree that gave rise to every tetrapod—every bird, mammal, reptile, and amphibian. The mudskipper has a long way to go, and many hurdles to leap, before we will know whether its part of the evolutionary tree is special. If paleontologists 300 million years from now dig up the remains of a mudskipper, they will write chapters about its role in a "great" transition only if its part of the evolutionary tree has branched into many twigs. The mudskipper will get extra special treatment if one of its evolutionary branches leads to the paleontologists' own species. Our understanding of the fish-to-tetrapod transition is not limited to long-dead fossils or obscure fish that climb trees. We have access to the DNA of every creature alive today. This is an enticing record of evolution, because DNA builds our bodies and is passed from generation to generation. By knowing how DNA works, we can dissect the molecular machinery that builds animals. This defines a whole new research program, one that was unimaginable in Romer's day. We can now compare the genetic recipe that builds a fish to the one that builds a tetrapod, in order to ask the question, What genetic changes are needed to turn a fish into a tetrapod? To see how this works, it helps to understand how DNA builds bodies. Every cell of our body has the same DNA inside. The various cells of our body are different because different genes are turned on and off in each cell. To understand what makes a cell in your eye different from a cell in the bones of your hand, we need to know about the genetic switches controlling the activity of genes in each venue. This leads us to the important point: These genetic switches help to assemble us. When we are conceived, we start as a single-celled embryo with the DNA needed to build our body. To go from this generalized cell to a complete human with trillions of specialized cells packed in just the right way, whole batteries of genes need to be turned on and off at just the right stages of development. For evolutionists, this information is a boon. We can compare patterns of gene activity between different creatures to assess what kinds of changes are involved in the origin of new organs. Take appendages, for example. When we compare the ensemble of genes active in the development of a fish fin to those active in the development of a tetrapod limb, we can make a catalogue of the genetic differences between fins and limbs. This comparison gives us some likely culprits—the genetic switches that may have changed during the origin of limbs. Based on what we know so far, the list is small: Very subtle changes in the activity of a relatively small number of genetic switches appear to underlie the differences between fins and limbs. To some extent, this should be obvious from the paleontological discoveries. Fins and limbs are part of a continuum, and no extraordinary events, processes, or genetic mechanisms are needed to explain the evolutionary transformation. There are even clinical implications to all this. The genetic switches involved in the fin- to-limb transition are not 370 million-year-old relicts that lie in our bodies unchanged from generation to generation. Some of the genetic raw material of the fish-to-tetrapod transition still does business inside us. In fact, these genes continually mutate, sometimes with great consequences. Three hundred and seventy million years ago, changes to these genes led to the origin of limbs with fingers and toes. What happens when these genes change nowadays? Mutations can cause missing, malformed, or extra fingers in children. We now know that the "great" transformation from water to land has so many fossil intermediates that we can no longer conveniently distinguish between fish and tetrapod, that living fish are bridging the water-to-land transition today, that some of the genes implicated in the ancient transition still reside and mutate in living animals, making everything from fish fins to human hands. Armed with this information, let's return to our opening handshake. The structures we shook with—our shoulder, elbow, and wrist—were first seen in fish living in streams over 370 million years ago. Our firm clasp is made with a modified fish fin. Actually, we carry an entire branch of the tree of life inside of us, and it does not stop there. That broad smile we give when we shake hands? The jaws that form our grin arose during another ancient "great" transition. The pair of eyes we use to make eye contact? These were the product of an even more ancient "great" transition. The list goes on and on. We can understand how all these things came about by using the same tools we did in this essay. Perhaps that is what is so profound about evolution: Everyday biological processes can explain things that seem special or mysterious about the living world. What is really powerful is that our explanations can be tested by an examination of the evidence. The evolutionary biologist Neil H. Shubin is chair of the Department of Organismal Biology and Anatomy at the University of Chicago. Excerpted from Intelligent Thought by John Brockman Copyright © 2006 by John Brockman. Published by Vintage, a division of Random House, Inc.